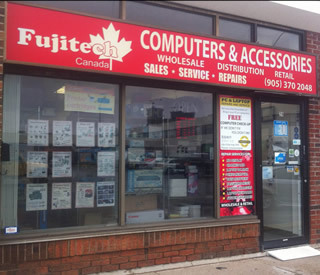 Fujitech is your one stop full service computer & laptop repair facility in Toronto & GTA. We offer a wide variety of laptop and desktop computer solutions from simple upgrades to motherboard repairs. Full range of Point of Sale equipment from TouchScreen systems to Cash drawers, Thermal receipt printers, pole displays and a variety of barcode scanners for retail business, healthcare and restaurants. We install and service CCTV security camera systems, Analog, HD-CVI, HD-SDI, IP Cameras and setup remote view on your laptops, iphone or android phones. 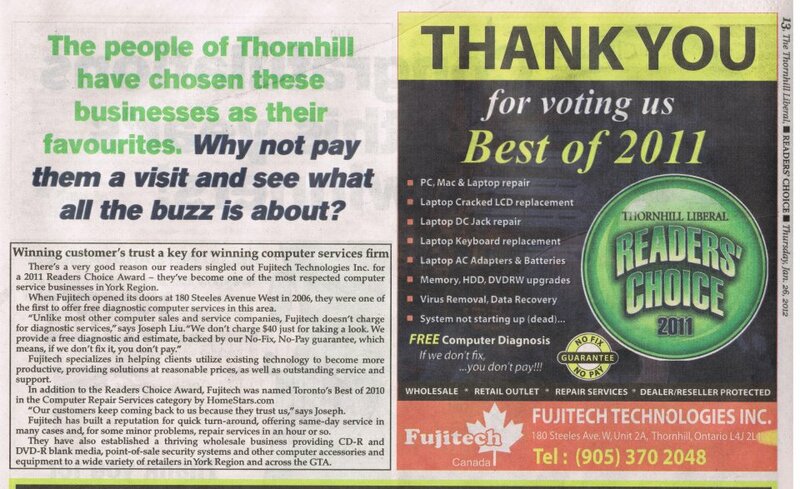 Fujitech is a wholesale distrubutor for computers, blank storage media (CD-R, DVD-R, BD-R, etc) & accessories and also a retail outlet providing PC & Laptop repair services in Thornhill, Toronto & Greater Toronto Area (GTA). In addition to our Wholesale & Retail sales of computer products, we have over 10 years of experience in computer repair/support and home & office IT devices. 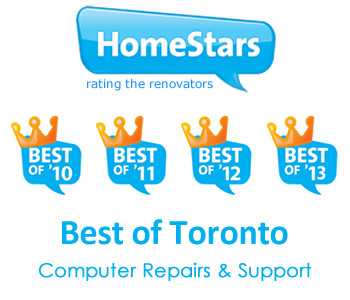 Our business provides emergency same day computer repair inquiries in Toronto & GTA. We are a staff of dedicated technicians who take pride in assisting you with the diverse cluster of computer issues. We know it can be frustrating and time consuming troubleshooting your IT needs. Our dedicated Certified A+ and Network+ technicians specialize in the repair and service of computer hardware and software as well as networking, virus removal and data recovery. 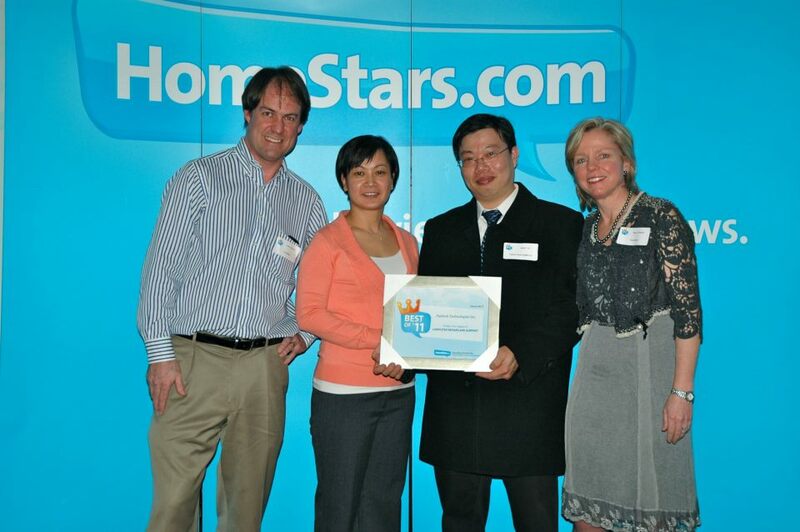 We value every client of ours and strive to excel in our services provided and in turn our valuable clients have consistently voted us the "Best of Toronto 2011, 2012, 2013, 2014, 2015, 2016, 2017 & 2018" by Homestars in "Computer Repairs & Support category". 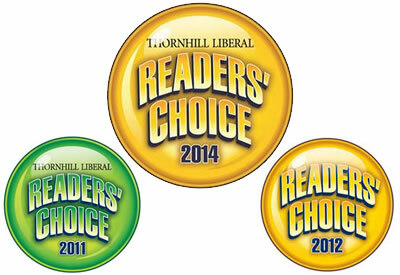 We were also proud winners for "Reader's Choice Best of 2011, 2012 & 2014" for Computer repairs & Support by Thornhill Liberal. We take pride in being the first in Toronto to offer a FREE no-obligation PC diagnosis, with a "No Fix No Pay" Guarantee, which means if we don't fix, you don't pay. 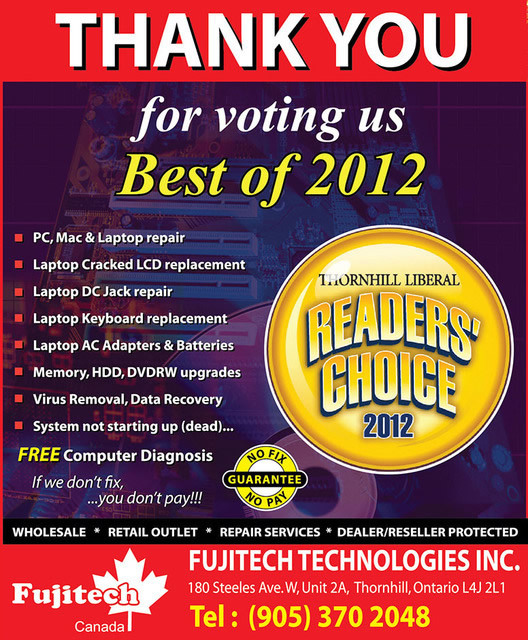 Fujitech is your one stop full service computer & laptop repair facility in Toronto & GTA. We offer a wide variety of laptop and desktop computer solutions from simple upgrades to motherboard repairs. When you need your computer fixed fast, we are just a phone call away from getting you up and running in minimal amount of time. A lot of computers are infected in some way with unwanted intrusions ranging from spyware to malicious viruses and Trojans. These days it is critical to update your Anti-Virus software and make sure that you are fully protected. A computer infected with unwanted intrusions is not only a security and personal information identification threat, but it also are the most common factor that causes a slow and unresponsive computer. These infections could cause considerable damage to important system data files and unfortunately could cause you to lose all your data, hence it is important to make sure that you are fully protected. Fujitech Wireless network services will give you the ability to enjoy the use of your internet & network enabled printers around your home or office. Wireless networks are becoming the new norm of computing and we can setup your network for hassle-free internet, file & printer sharing. We will secure, encrypt and protect you from outside intrusions and where necessary, even boots your wireless range to get you maximum wifi signal in your home or office. Computers are now a part of our daily lives. We rely on them to store our precious documents and we use our computers as the information gateway to the rest of the world. Just as any equipment like motor-vehicles, computers also require periodic maintenance to keep them in optimal condition. A periodic tune-up and optimization will help maintain your computer in proper working order and avoid you getting into frustrations of slow and unresponsive computing experience. Our specialists will install, upgrade, repair and configure your software to your satisfaction. Our specialists will optimize and configure your software according to your personalized needs. When it comes to computer hardware installations, upgrades or removals, we understand the downtime for the computer is critical. Fujitech can be your partner to handle such requests on short notice as we understand that computer downtime is not an option as your business does not stop. Frustrated with your existing Internet Service Provider with locked in contracts, poor customer service and outrageous fees? Sign up for Teksavvy High Speed Internet and enjoy a no hassle, no contract, high bandwidth Internet without breaking breaking the bank.